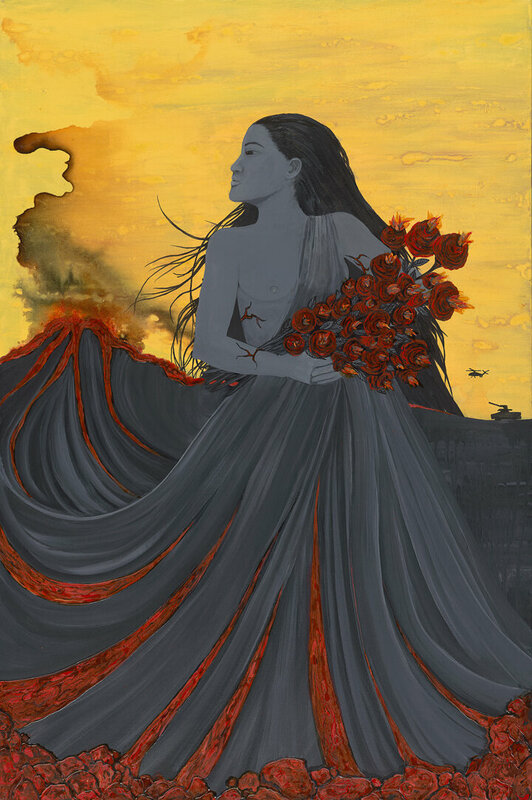 Story: My Feminine Almighty series raises questions about how our beliefs affect gender roles and political power, and who controls an afterlife. 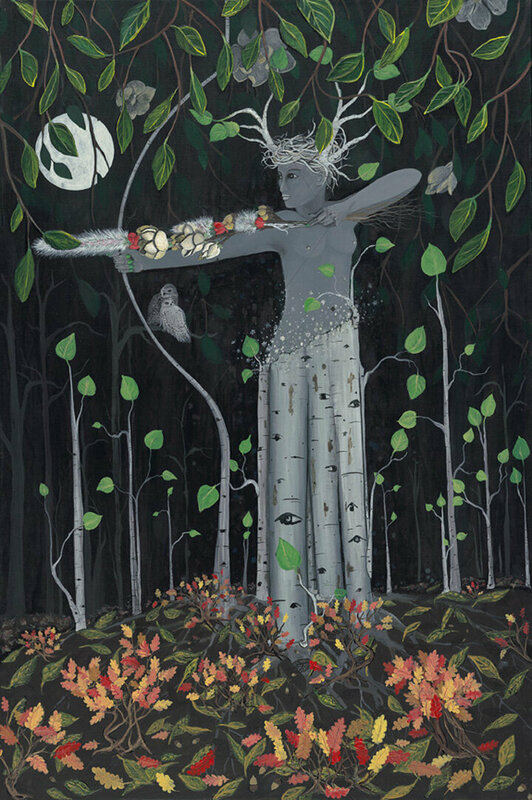 These surreal magical figures are my reclamation of goddess power. Contemporary news and social media proliferate with stories of the torment and oppression of the femininity of women, and bi-sexual, homosexual, and transgender people. I wish for this series to be a harbinger of change. 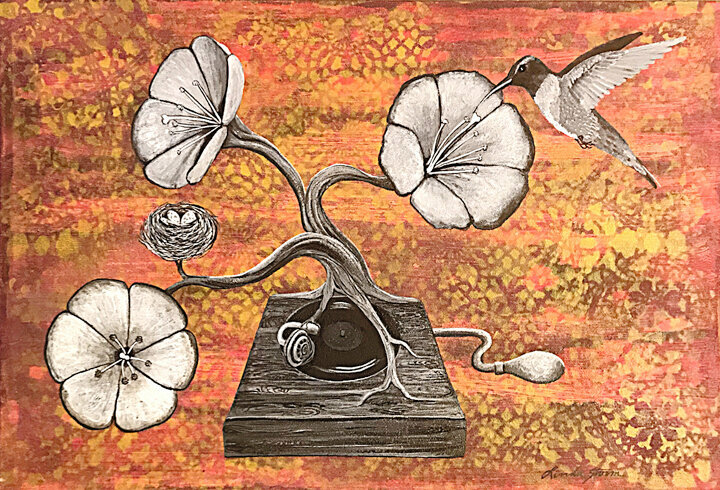 Story: This painting is a commission from my MUSIC series of paintings that were projected on the stage during the New Mexico Platinum Music Awards at the historic Lensic theater in Santa Fe, NM. 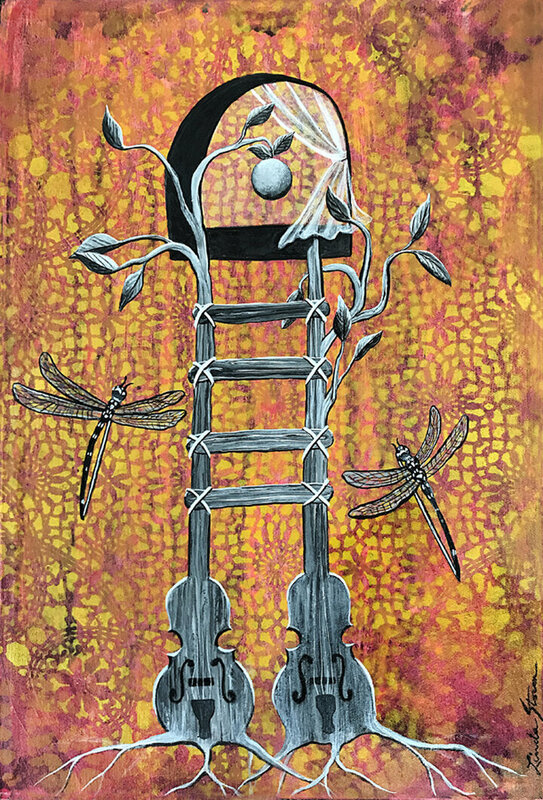 Story: This painting from my MUSIC series was inspired by a story shared with me by producer David Schwartz. He left his house for a meeting scheduled with co-founder of Hummingbird Music Camp, Wanda Higgins. The walk to his car was thwarted by a persistent hummingbird that fluttered in his face for several minutes. It was at the time of Wanda’s passing. She was 97. 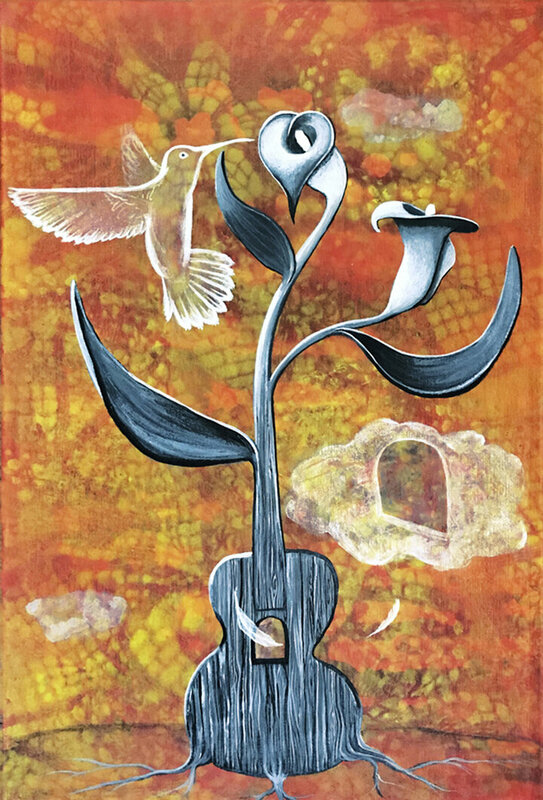 This painting became the cover for the program of the New Mexico Platinum Music Awards and projected on the stage during performances at the historic Lensic Theater in Santa Fe, NM. 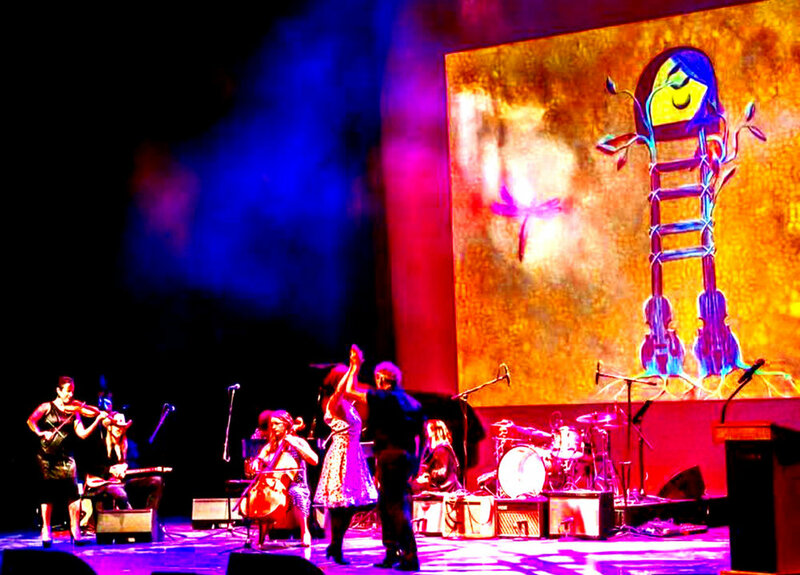 Story: From my MUSIC series of paintings that were projected on the stage during the New Mexico Platinum Music Awards at the historic Lensic Theater in Santa Fe, NM. Music and art make magic on stage at the Lensic Theater. Although these paintings are small, they worked beautifully as projections. I love to collaborate creatively with others. Contact me with any questions. Story: As the sun sets the moon brightens. This is how it appears in full daylight. Story: As the sun sets the moon brightens. The moon is beginning to reveal its glow. Story: The room is dark. The moon is revealing its full glow. You can see I painted a few tree branches too. 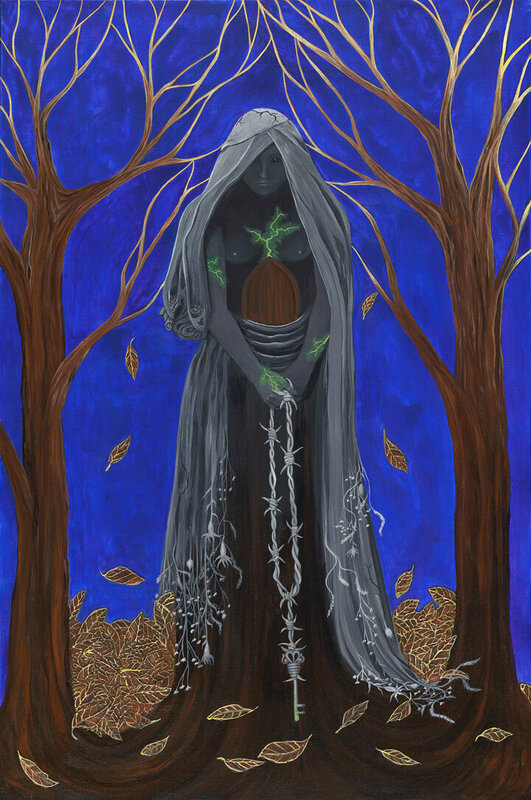 Story: The moon glows in the dark as the room darkens in this painting that evokes the spirit world of trees. 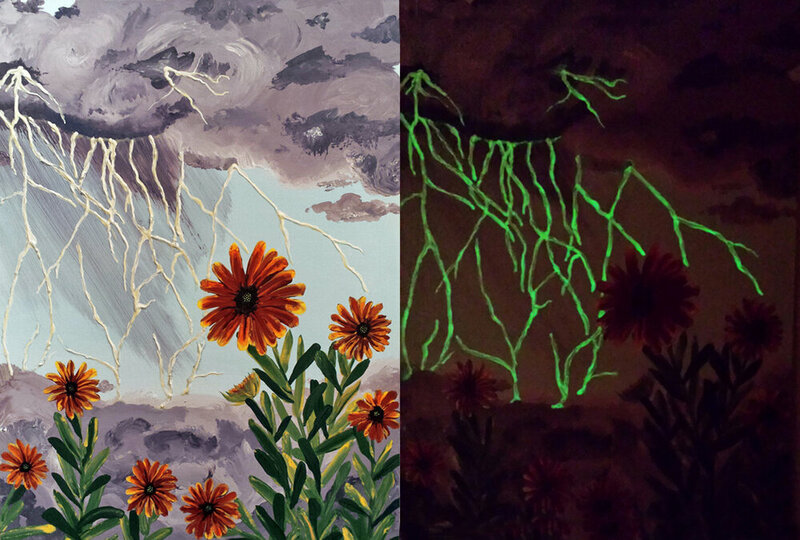 Story: I painted a series titled Flowers in the Storm which this fits, although I placed it in the Glow in the Dark series, it is inspired by my amazement at how flowers survive violent storms. Ah nature…The lightning is glowing in a dark room. Story: A post apocolyptic surreal series of city-scapes made of chess pieces and overgrown with greenery. It could also be part of my Glow in the Dark series, as the moon glows. Story: From my post apocolypce surreal series of city-scapes made of chess pieces and overgrown with greenery. It could also be part of my Glow in the Dark series. Here you see it in a dark room. Story: During a time of intense change in my life a very small butterfly appeared inside my studio. I painted it on the toe of the girl as she swings over a surreal and unknown landscape. The moon glows blue in a dark room. Story: During a time of intense change in my life a very small butterfly appeared inside my studio. I painted it on the toe of the girl as she swings over a surreal and unknown landscape. 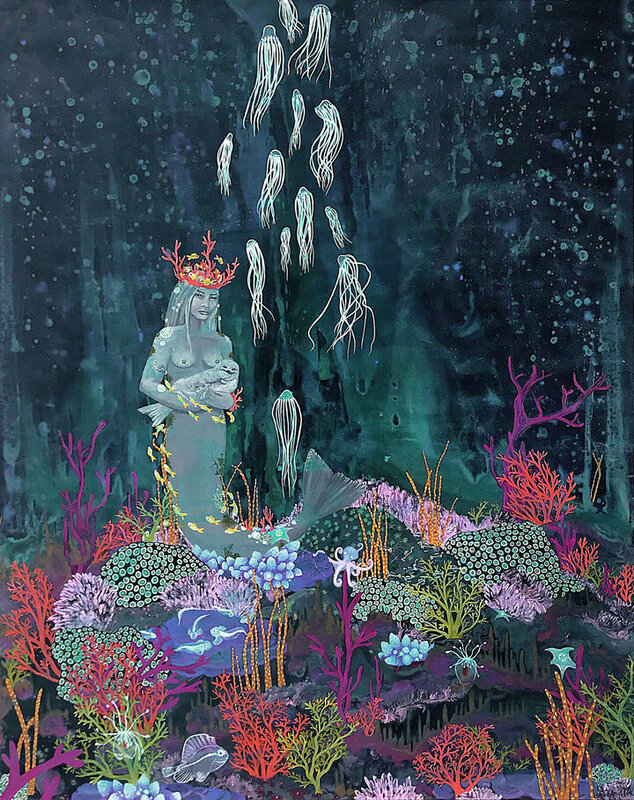 Here is the painting glowing in a dark room.